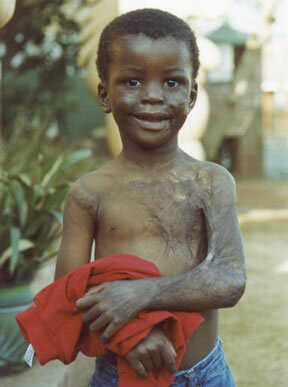 A recent photograph of Bafana showing the progress he has made. Bafana was born on 8th June 1999. He has a left arm contracture from historic burns, exacerbated by the lack of occupational therapists and followup in the state system. He lives in Alexandra township. His name means 'boy'.. but one of his hospital cards calls him female! 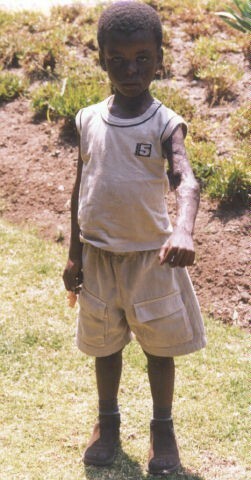 He arrived at Johannesburg General Hospital for surgery in August 2003 but they turned him away, despite the fact that he had been starved, as they had wanted him admitted the day before. He will now, hopefully, get the contracture released in early 2004. Bafana Nzima with UMashesha member Emanuel Mthombeni, flanked by Bongani Madlala (10) and Mfundo Ntamehlo (17). 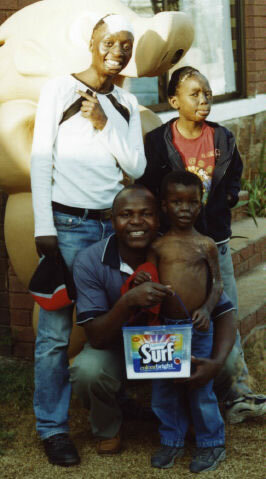 Emanuel is holding the box of washing powder because he had to deal with Bafana's 'accident' on the way to Children of Fire. Next time Emanuel will remember to ask a four year old boy if he needs the lavatory before travelling - but the UMashesha must be prepared to deal with any problem.